I got this in the mail yesterday. I wasn't even gonna open it because it was folded in half. But I decided on a whim to check it out. This is what I saw when I opened it. What is your reaction? Maybe you don't think it's a big deal. But I do. I kind of hate it. I am reading a book which I will constantly reference in this post and a few more I plan on writing. It's called Going Up Green by Deirdre Imus. The important thing for me to state here (and she is on the same page) is I am not against vaccinating. I am in favor of educating! I have 2 school-age kids. And 2 times I have been told that my child cannot start school because their shots aren't current. They'll tell you that but they will NOT tell you about the waiver/exemption form that is available. I have signed one, and I'll sign the other tomorrow. Please go read/download/be aware of the form here! I'm not going to go into toooo much detail but I would like to make you aware of a couple of additives/preservatives (called adjuvants) that are in most of the vaccines you give your child. While I completely understand that additives are necessary to prevent the growth of germs, to keep them from spoiling and to keep them stable etc., I do not understand why we as parents don't care that these very things are toxins that can also hurt our kids just as the things we are vaccinating against! You can see a list of the CDC's vaccine ingredients here. Please. Go take a look. Really. Read through those ingredients. Again, I'm trying to take a more informative approach rather than an argumentative one. I just want people to be informed! I recommend doing research on aluminum and thimerosal specifically and then the next time you are at your doctors office, ask to see the insert! Vaccines do not have to be a "one size fits all" thing. They really don't. You have the right to customize your vaccine schedule to your child's individual needs. 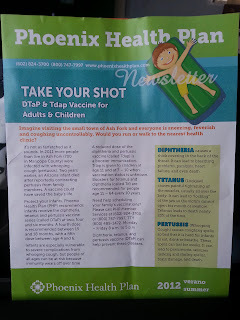 I'm going to start doing just one vaccine per month (and i'll only do it if it doesn't have the nasty ingredients). That way I can test my kids for titers which I didn't know about until finding this book. You can read more about titers here. It's the protective level of antibodies present in blood. If my kids have positive or "immune" levels (because they've been exposed before or because of the vaccine) they may not need further vaccines of that type. Okay I'm done for now. I have a lot more to say but I'll give it to you in doses (get it?) lol. Yes, I severely dislike the propaganda being shoved down our throats. I am tired of being told what to do just because we're "supposed to." I won't ever judge any parent for their decisions, as long as they have made those decisions through thought, research, and conscious choices. And I hope that others will give me the same allowance. Including the government. Ugh. Lisa, I'm shaking my head over here. You and I are both from generations of vaccinated people who have nearly eradicated these diseases and yet you think you can second guess that success? Have you ever seen a child suffer through pertussis? How about something as simple as measles and what complications can arise from that? Do you know anyone with tuberculosis? We don't have the personal history of the horror of these illness on children. Why? It's called vaccination and herd immunity. Sure a few kids can be safe if their parents don't vaccinate them, but the current trend away from vaccinations (over misinformation and fear) is putting children at MORE risk. Vaccinations are safe - for the majority. Tuberculosis is not. Diphtheria is not. Pertussis is not. Measles is not. Your children are no longer safe from these illnesses simply because too many people are opting out of vaccinations and the herd immunity is at risk. Geesh, do we really need a nationwide outbreak of killer yet easily prevented disease to get the anti-vaxxers to finally shut up? Read this, follow the links, learn from real scientists. Think about how you'll deal with YOUR child coming home with pertussis and getting your baby sick - to death. When you could have so easily prevented it. Besides that, I miss you kid! Hope your little family is doing better now that it's back together. Debbie! Thanks for writing! We are doing so much better now. Well except that I am cleaning up after 4 kids instead of 3 again. lol. I actually HAVE had a child with pertussis who has been vaccinated (but I plan on writing a follow up post about vaccines). I hope you didn't misunderstand that I am not an anti- vaccinator. (Is that a word? lol) I am a SmartVax advocate. I'm glad you wrote in though. I appreicate people who share their opinion.